Germany face Ireland in the group stages, along with Austria, Kazakhstan, Sweden and the Faroe Islands. 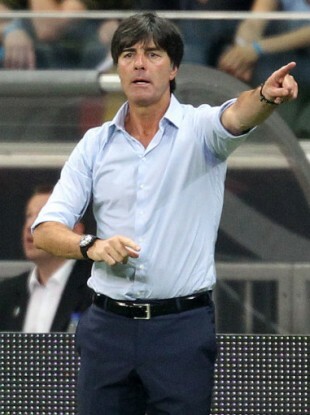 GERMANY MANAGER JOACHIM LOEW expects qualifying for the 2014 World Cup to be tougher than this year’s European Championship. Loew’s men, who won all 10 matches on the road to Euro 2012, host the Faroe Islands in their opening Group C clash on Friday, ahead of matches against Austria, Ireland, Kazakhstan and Sweden. “We qualified for Euro 2012 in style. We won all the games,” Loew said on Wednesday. He added: “Against the Faroe Islands especially I expect a better defence from our side than in the games before. “I want the attacking players to be the first defenders. If we want to do this better in the future, then the attacking players need to learn how to switch from attacking to defending in a quick way. Despite Germany’s disappointment in Poland and Ukraine, midfielder Mesut Ozil said it was time to focus on the next challenge. “We made it to the semi-final and to be knocked out so close to your dream is always bitter,” Ozil said. “We played very good as a team, especially in the group stage. We had a tough group, but won all games. Email “Loew expecting a tough battle to qualify for World Cup”. Feedback on “Loew expecting a tough battle to qualify for World Cup”.